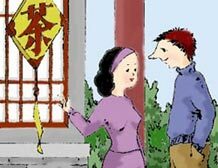 lì li: nĭ xĭ huān hē chá ma? Lili: Do you like drinking tea? mài kè: wŏ fēi cháng xĭ huān. Mike: I like it very much. lì li: zhōng guó de chá tōng cháng fēn wéi wŭ zhŏng. Lili: Chinese tea may be classified into five categories. mài kè: nă wŭ zhŏng? lì li: lǜ chá, hóng chá, wū lóng chá, huā chá,jĭn yā chá. Lili: green tea, black tea, Wulong tea, scented tea, and compressed tea. mài kè: wŏ xĭ huān dào chá guăn lĭ hē chá. Mike: I like drinking tea at teahouses. lì li: wŏ yĕ shì. zài zhè lĭ kĕ yĭ biān liáo tiān biān xīn shăng chá wén huà. Lili: So do I. We can chat while enjoying Chinese tea culture here. mài kè: chá qĭ yuán yú zhōng guó. rén men rì cháng shēng huó zhōng lí bù kāi chá. Mike: Tea originated from China. It is the center of attention in Chinese daily life. China is the homeland of tea. Chinese tea may be classified into five categories according to the different methods by which it is processed. It includes green tea, black tea, Wulong tea, compressed tea and scented tea. Teahouses scattered in cities are most worthwhile to visit. One may come in the early morning and order a pot of tea, chat and enjoy the warm sunshine at the same time, until it closes in twilight.